The Slim Ink Pad Holders are designed for ink pads that are narrower and have compartments that are 2-7/8" wide. Inks from ColorBox®, Memento™, My Favorite Things™, a-muse studio™, and many more will fit perfectly in these Holders! 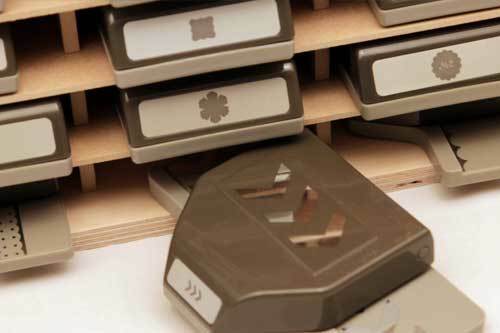 The finger slot cut in each divider makes removing the ink pads easy and the dividers can be taken out for storing larger accessories. (The sturdy center divider is not removable.) Check the dimensions listed below to make sure yours will fit. Each Slim Ink Pad Holder includes labels that are sized to place on the short end of your ink pads so you know what colors you own. This product has the option of being wall-mounted too! This slim holder was a smart add to my craft room. I love the organization an it's easy to store/set aside. I purchased this ink pad holder as the picture on line and in the catalog showed that it would accommodate different ink pads. When I got my holder it was the great quality that I have always gotten with Stamp n Storage. The reason I couldn’t give this product a five is because my Color box inks do not fit in the slots as I thought they would with the product display I saw on line and in catalog. Disappointing once I got the item. I bought the big one and couldn't be happier with it!! Very sturdy, well built. Now all my inks are on the wall and not taking up space on my desk!! Love it. The slots fit the odd shaped stray ink pads I've accumulated. The spare slots house my alcohol inks and markers, so that I finally have all of my ink colors in one location. I got the single biggest "slim" holder that ya'll make. I, like many other people, have several different brands of inks. I now have things organized by color by brand. I'm so happy not to have pads laying around in drawers now. MFT, Gina K, SSS, color box - they all fit beautifully! After getting the Distress ink pad holders, I just had to have the Slim Ink Pad Holder - 120. Glad I did. All my ink pads are in one area and are so organized. SNS makes great products and I received my shipment in a very fast timeframe. Well constructed and looks great in my stamping area. Thanks so much. As a Fun Stampers Journey Coach I have a lot of ink pads and wanted to find the right storage unit for them. This is perfect. I love that the storage unit itself does not take up a lot of room. It is so nice having my inks at the ready when I am creating!!! Thanks so much for getting the new stamp holder to me so quickly. Order placed in the morning, shipped in the afternoon and arrived last Tuesday. Is already in use. Great quality build and such super service. I love it and your company! This slim ink pad holder is exactly as described. Love how organized my craft table is! Thank you! This is the fifth storage unit I've purchased from you guys. It does exactly what it's designed to do. It is very well made and fits perfectly on my desk. I ordered the unit on Sunday 12th November and it was at my house on Thursday 16th, and on the desk and full by 17th November. I highly recommend your products. Thank you so much! 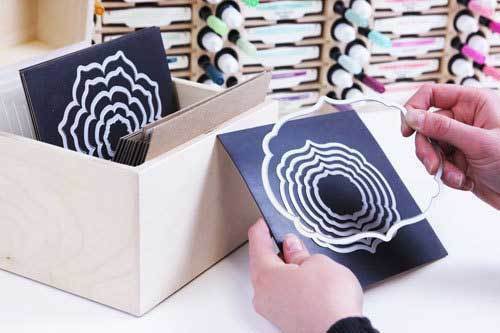 Love the stamp and storage ink pad holders. This is my third one! The slim design is great. I also have the regular one and the distress one. I love my organized ink pads. Visible and so easy to grab the ink pads. Thank you and bless you. I ordered this to go along with my combo unit. I had many slim ink pads in tubs and was constantly looking thru them to find the right one.labels are included so I now know which ink pad I am looking at, without sorting through them. Would highly recommend. Good quality, excellent customer service and quick delivery. Very nice workmanship and great customer service, too! I've wanted a stamp pad storage unit for quite some time and finally decided I would try this model/brand, and I'm glad I did. Unfortunately, due to rough handling in shipping, sadly, my unit arrived damaged. I immediately called and emailed to advise Stamp N Storage about the problem. They were very helpful, and since I emailed a picture of the damage, they IMMEDIATELY sent out a replacement. Now THAT is great customer service. 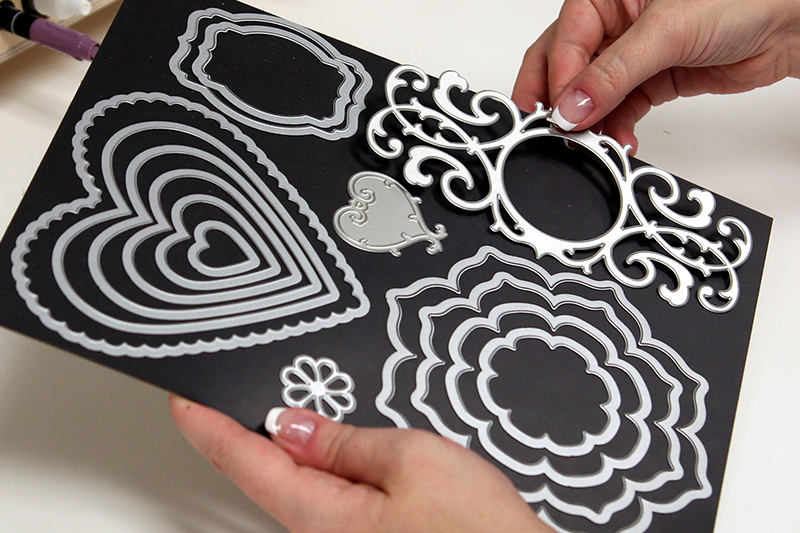 The unit is very well made and I love having all my stamp pads at my fingertips! I highly recommend this company and their products! This arrived packaged very well. It was much better quality than what I was expecting. It is unfinished, which is good because you can stain it or paint it to match your decor. I have Hero Arts, VersaMark, Versafine, and Memento ink pads stored in it. I have only been stamping for 3 months, but I am so happy with it that I plan on buying another one that holds different size ink pads as my collection grows and buying the other storage products as my budget allows. Finally, a place I can see my inkpads at a glance. My only regret is that I didn't have room to order the larger size. I will have to make room in the future. It's so nice to be able to see the colors and coordinate my projects ahead of time instead of digging through shoeboxes for my inkpads. The quality and price are great. I'm a happy stamper. I love the slim ink pad holder. Very well made and so nice that adhesive labels are included. The only thing that is not perfect, is the bottom row design. Very difficult to get the ink pad out of the slot, could use a finger slot cut in the bottom edge to make it easier to remove those bottom ink pads. Finally Ink Pad storage that really works! This is a beautifully made ink pad holder for slim pads. It does the job without taking a lot of space. Love it! I asked for a later shipping date, but it was shipped right away and sat on my doorstep for two weeks. Fortunately it did not get wet, nor did it walk away! Will be much more careful when placing orders in the future! I already have the Combo Holder and the Distress Ink Holder, so this is the perfect addition to my ink storage solution. Thank you for such a well made product. I love the products from your company but this time I had to take all the little shelves out and line them back up because they were all crocked and the sides of the box were all bulging out and the staples in the back had damaged the wood. But now it is back together and looks fine and you can't see the back because it is up against the wall on my desk. This holds all my ink pads ! The measurements where spot on so it fit in space I had in mind. Well made, so beautiful my ink pads never looked better! My little space never looked better. I'm so excited about the 120 sized ink pad holder. I am finally able to fit all my ink pads between the 120 and the 72 I finally have all my ink pads easily accessible! I painted mine white to match some of my cubes and my 72 ink pad holder. I originally ordered the standard ink holder and with the great customer service, I was able to exchange for the slim ink pad storage unit. It fits perfect on me shelf and all my inks are nicely displayed. I would recommend this unit to anyone using inks other than Stampin' up. They fit nicely and easy to grab when needed. Why didn't I buy this sooner!?! I am loving this ink pad storage. I love the wood smell as you first open the box. If fits nicely on my desk and I love being able to see all ink pads.. I also have to say that customer service was amazing and the shipping was fast. This is not the first thing I have bought (I have 3 of the marker nooks) and this will not be the last. I can now find all my inks! They are organized by type & color! Great storage! When I first looked at this ink pad holder I thought it was a bit pricey but I went ahead and ordered it and I am so glad I did!!! The craftsmanship and design are exceptional. I have plenty of room for my growing collection of pads in a relatively small and quite efficient space. Will be ordering more products in future. This is a well built piece for organization. Disappointed that it doesn't fit my Distress Inks, but luckily I don't have too many of the full-sized pads. I just finished putting sealer on the wood and hanging it and it looks great. After searching for an organizer for my inks this was the most well made and most reasonably priced piece I found. This is the best idea!!!!! I absolutely love it!!! This ink pad holder is perfect! I have a missmash of ink pads and found this unit could hold most of them. I had to swap it from my original order of the standard holder since my pads were small (StazOn, Colorbox, Versafine, etc.). It was super easy to swap out my order too! I am so happy with my new slim ink pad holder. All my ink pads fit perfectly. Very well made and ink pads look nice and organized. I will be ordering the Petite Ink Pad holder next. Thank you for such a great product! 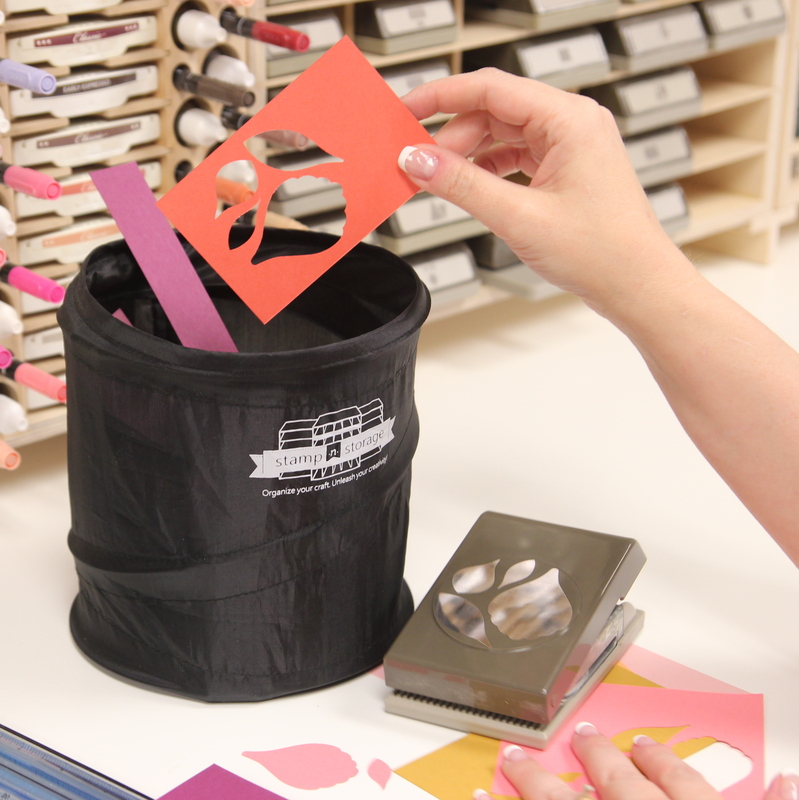 The Slim Ink Pad Holder was the perfect answer to "where am I going to put all my ink pads." They are easy access and organized! I have purchased a few storage items from this company. I have never been disappointing in anything I bought. Just want to bring this your attention again ... Stamping Up pads are too large for this unit. You cannot beat the quality of this product. Shipped perfectly too! It is so well made. I only got the 36 slot ink holder, but it truly is a piece of furniture. I just love it! Perfect fit for my Anna Griffin ink pads. Now I need more for my Stampin' Up! inks, markers and reinkers! I will come back for more, I just know it. You all are the BEST!!!! I love ALL your storage solutions. I could use a roomful...easy!!! I Love how Organized all of ink pads look Now! Great design - holds the ink pads I have and it is nice to see all of them! Have never had a way to store the smaller ink pads...this works well and fits with the StampinUp ones I have had before. And labels, too!!! Love this storage holder for ink pads will have to order another for smaller pads. 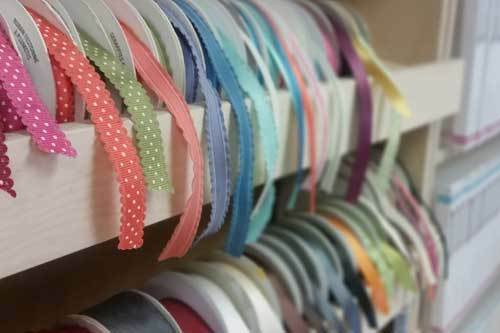 Love organizing my craft room!! I'm thinking about painting the box white. Quality materials, sturdy construction; however, I have difficulty getting my Papertrey Ink ink pads into some of the spaces, while other spaces are quite roomy. With this ink pad holder I will now be able to find my ink pads. I really like it as it sits right on my counter where I stamp. Fits perfectly into my IKEA storage shelves and eliminates my hunting for the smaller stamping pads. I had been looking for a storage solution for my ink pads and this worked wonderful. It was slightly bowed on the sides when arrived but my husband was able to secure the sides and it is very strong. I would have given this 5 stars but one side of my unit the wood is warped. Too much hassle to send back and it works just fine as it is. Great way to organize all my inks. Love it. What an awesome product this is. Everything fits perfectly. So nice to have them all right where I need them. I have both the regular ink pad holder and the slim ink pad holder. I bought the 60 ink pad and 48 ink pad. I love both of them and can't wait to get the petite ink pad holder for Christmas. They hold all my inks and i still have room for some more if I purchase any in the future. They are sturdy and are stacked on top of each other. My only complaint is that its not white. This is the 7th one I've purchased. I love this storage for my ink pads. Easy to get only the one I need without moving anything. I have tried many things before this but nothing after this. I have 2 of the 120 slim ink pad holders and love them. It has made life so much easier being able to see and have my pads w/in reach. Another quality piece for my new crafting space. The wood is so nice. I am just adding some varnish to protect it from getting discolored. 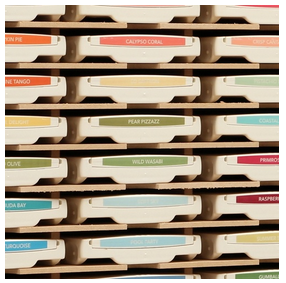 Getting really excited to see all the Stamp n Storage pieces in their new home! 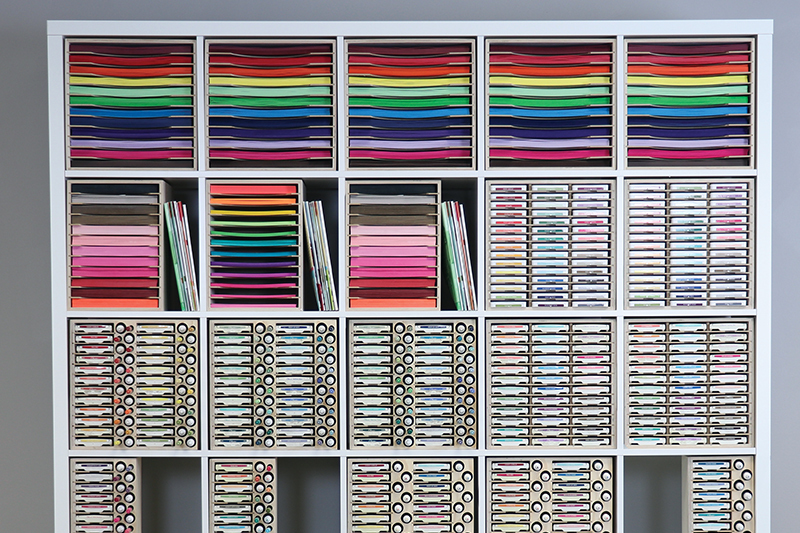 Thanks for making pretty organizational tools. 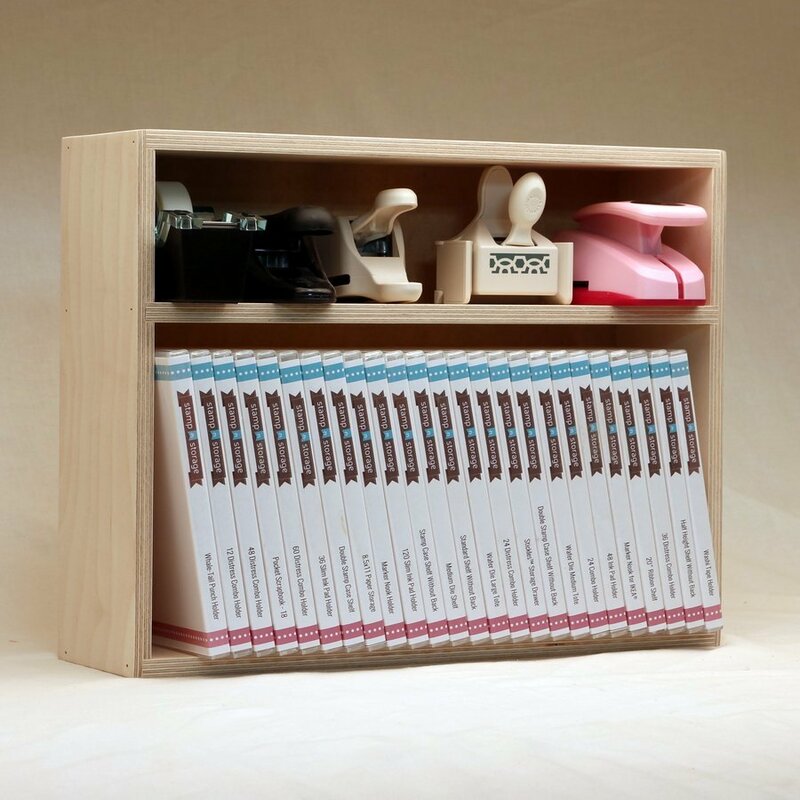 I had been researching storage options for my custom built craft space and came upon Stamp N Storage's products. After watching the video series I was hooked! Shortly after, I found out they would be in my area at a craft expo, so I bought a ticket just to see the products in person. I was very pleased with the quality of each piece and how well Brett understood the need for specific design options. Thanks to his crafty wife I believe. I've ordered the Slim 36 ink holder & side by side marker holder. Up next - a special order! Worth every red penny. I have 2 other holders, one for SU and the other for Distress. This is going to be perfect for SSS, PTI, and other inks. Thank you for organizing the aRt caVe. All my ink pads in one place! I had ink pads in several different areas. Some never got used because they weren't convieniently located. With my new ink pad holder they are now front and center and within my reach! built to last. Husband said it was better than he thought it would be. It's just what I wanted for my ink pads. I love it! I've been wanting one of these to organize my inks for a long time. I ordered the slim ink storage 120 first and was so impressed after I got it that I ordered the slim ink storage 72 to finish organizing my ink pads. My stamp pads were everywhere and it's so nice to just go to my holder and they are all there. Love it! 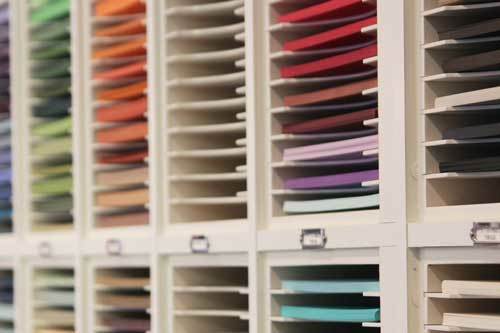 I was so impressed with the quality of the Stamp-N-Storage products I purchased. They more than met my expectations and the customer service I received was equally as impressive. Quick responses to my questions (within the day) and happily willing to work with me on my time restrictions due to picking my order up at a shipping depot in the states (I'm from Canada). 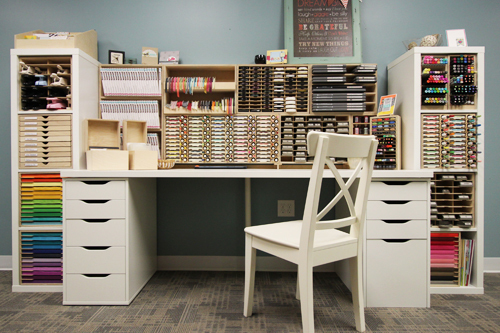 I have been dreaming of a craft room filled with Stamp n Storage products for a long time. I decided to start one at a time tand the slim ink storage 120 is perfect for me. Since my inks were scattered in drawers and boxes I didn't realize how many I had until I drug them all out. My storage is almost full. Maybe I should purge some. Thanks for making me a better crafter. When you have limited space and over 100 ink pads this the way to go. It so well built I know it will last a lifetime. I love all the units I gave purchased from Stamp N Storage. They are worth every penny. Yeah! 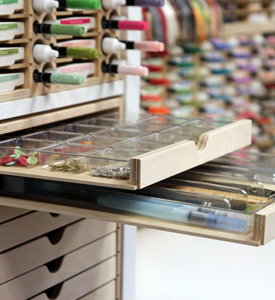 Finally a storage system that is both functional and well made. I ordered the 120 ink pad holder and I am just thrilled. I didn't realize how many ink pads I had and just ordered another 120 ink pad holder to finish organizing my ink pads and have some room to grow. One of the other nice touches is it comes with labels so you can start organizing immediately! This is well made and I know I will use my inks more often now that they are in my line of sight. Thank you Stamp-n-Storage for making such a quality product! I was so tired of always digging through a drawer to find the correct ink pad:(. I tried to keep them organized by color but they were always getting mixed up. They are now all organized by color right on my work desk:). I bought the 72 holder but think I probably should have gotten the 120 pad holder. It doesn't take up much space & now all colors are easily visible & right @ my fingertips:). Love it! Wonderfully constructed:). 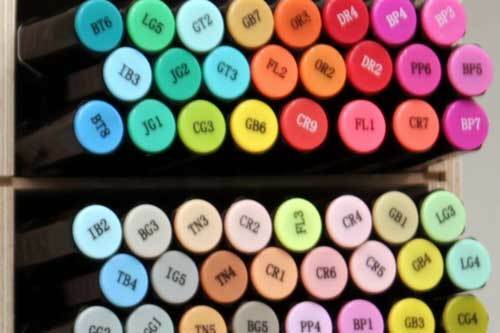 I thought it was kind of expensive when I ordered but not having my original aggravations when searching for just the right ink pad in a drawer of chaos has made the price worth it:). This is a great product. Better than any I have tried. Awesome product. Fits my desk nice, inks are easy to get in and out. Would buy again. I have purchased several different items from Stamp N Storage and I absolutely love them. The only reason for 4 stars instead of 5 is that I purchased one of these Slim Ink Pad Holders for Papertrey ink pads. Unfortunately some of the ink pads fit in so tight that they are difficult to remove. However, I purchased another of these units for Mama Elephant ink pads and it is perfect! This is actually the second time I have purchased an ink holder from the company. The quality and construction is fantastic! But what truly sets them apart is their customer service. They have my business. I love the size of the Slim Ink Pad holder. It fits my ink pads perfectly!! No more paper to put in the back so my ink pads don't go back too far. I love this product for storing my smaller ink pads. Loved this one so much , I've ordered another one! The slim ink pad holder is constructed well and looks nice. Unfortunately it is slightly too narrow to house Tim Holtz Distress ink pads easily which is a big shortfall for me. I will be honest, two of these holders came and they were broken. But the third one arrived just perfect. The folks at Stamp N Storage made it right, and were so nice to work with. I am in love with my ink pad holder! You can't find nicer people on the net! Thanks guys! I was able to sit this on top of my Standard ink pad holder. Very will made. I want more! I love it. It is perfect... the only problem I have is I should have bought the bigger one. I ran out of room, I had more than I thought. The new slim ink pad storage was just what I was waiting for. By allowing it to go in long ways you get much more storage without sacrificing space. I love and feel I can actually buy more ink pads. I have very limited counter space and feel this puts the pads at my fingertips which is good because if you can't get to easily, you likely will not use it.